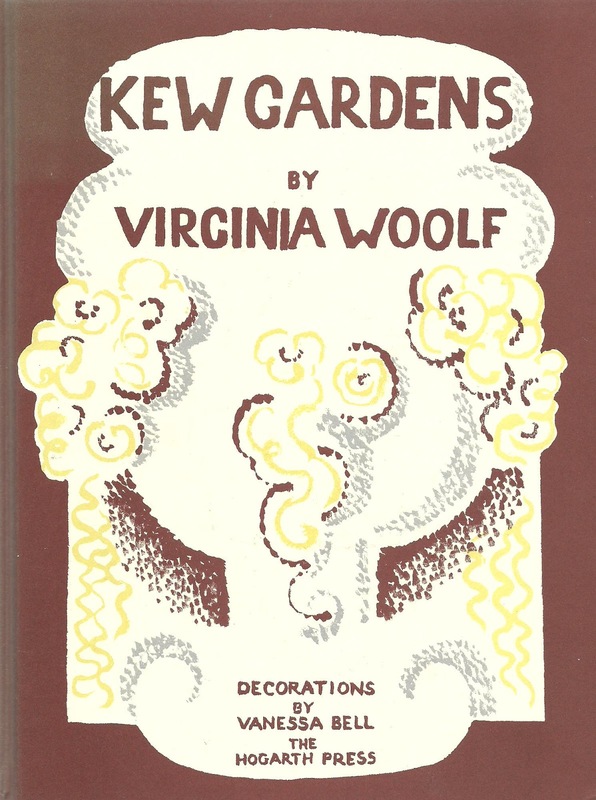 Virginia Woolf wrote Kew Gardens at the end of the First World War and published it privately in 1919. The book I borrowed from my local library was a beautifully illustrated copy of a limited edition of 500. 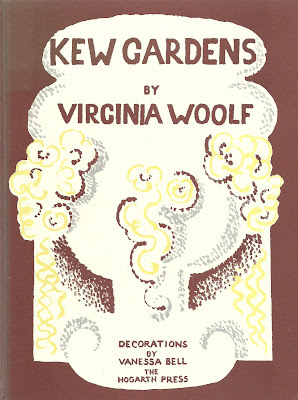 The illustrations were done by Woolf’s sister, Vanessa Bell, and the book was published by the Hogarth Press in 1927. 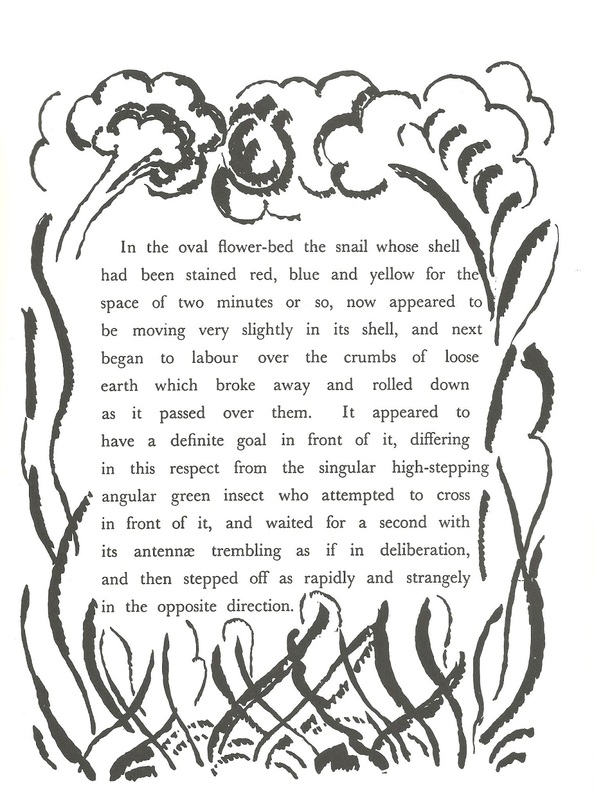 The book begins with a description of an oval-shaped flower bed in Kew Gardens in London on a hot summer’s afternoon. 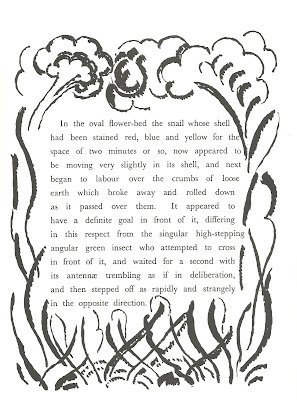 In the flower bed there is a snail which features throughout the story providing some continuity. 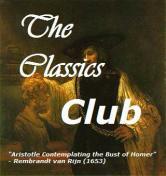 As the book progresses we overhear the conversations of four groups of people as they pass the flower bed. A couple are the first to pass - the husband is thinking of a time some 15 years previously when he had proposed to another woman in the gardens and he remembered “how the dragon-fly kept circling round us; how clearly I see the dragon-fly and her shoe with the square silver buckle at the toe. All the time I spoke I saw her shoe and when it moved impatiently I knew without looking up what she was going to say.” And we know too that the woman turned him down. Next to pass the flower bed are two elderly women, “of lower middle class”, who have noticed the old man and “like most people of their station they were frankly fascinated by any sign of eccentricity betokening a disordered brain, especially in the well-to-do.” This, I think, is an example of Woolf’s snobbery. Although the women are speaking, neither seems to be listening to the other. One of the women stops listening “letting the words fall over her”. The structure of the story works well as the snail and the flower bed are constant while the people move on. When sitting at airports I amuse myself by making up stories about the people around me. Woolf has done just that in this story and provided an insight into other people’s lives – a snapshot in time and then they are gone and the reader is left wanting to know more about these people and their lives. Another common thread in the story is the lack of communication between the couples – they are speaking but not really communicating. 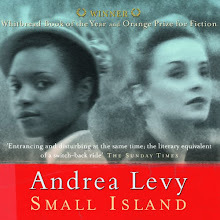 This short story was a very good introduction to her work and I am now looking forward to tackling some of her novels. Hi, I'm Margaret. Welcome to my blog. Having retired a few years ago I now have more time to spend on my hobbies which include reading and papercrafts especially card making and scrapbooking. I look forward to your company on one of my blogs.